Posted by Null in Ethics, Expression, Movies. 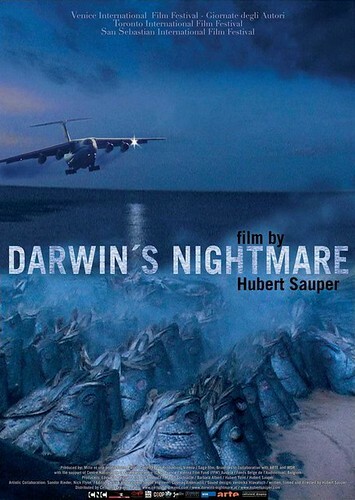 Darwin’s Nightmare (2004) directed by Hubert Sauper, is the Oscar nominated documentary film which portrays the economic Darwinism in Tanzania and the other countries associated with the Lake Victoria. The film explains how the economically advantaged big fishes of the world are exploiting the underprivileged tiny fishes of Africa. We are aware of barter systems where people used to exchange goods and services for other goods and services. In fact many nations still have barter exchanges. Such examples include Saudi Arabia/UAE exchanging food in return for oil and cash from Australia/US. But question always lie with the gains from trade. In most cases, it is not a win win situation in international business and trade. When we get greedy for business and trade, we ignore many other issues like the ecology, the business ethics, and the poverty. Rather we focus on exploitation, creating tension and enforced dumping. The film depicts an in depth analysis of an extensive research (although it may look controversial and offensive to some groups). It gives a vivid description of the case of Lake Victoria of Tanzania and the inhabitants nearby the lake. A new breed of fish, which looked commercially successful, has eventually transformed some of the African economies into a bloody economic and politcal war. See it for yourself and find out what has changed the life in that region.